The psychical organisation orders women to channel all their emotional energy on men, while the men ‘sublimate’ theirs into work, says Shulamith Firestone. Women have inspired most great works of art (if not being directly involved in the production), thus becoming the muse, the very core of the history of art borne out of great men. And so female nudes became a regular and where male nudes reached a high point, the men were homosexual. 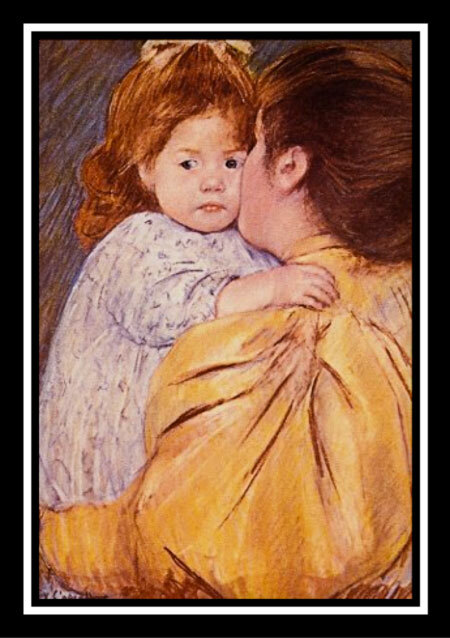 The Maternal Kiss by Mary Cassatt. Women failed to leave an indelible mark in the art scene in the past as they had to participate and compete in an all-male culture, on male terms, while being pressurised to prove themselves without discarding their female roles. “The tool for representing, for objectifying one’s experience in order to deal with it, culture is so saturated with male bias that women almost never have a chance to see themselves culturally through their own eyes… Thus, because cultural dicta are set by men, presenting only the male view… women are kept from achieving an authentic picture of their reality,” said Firestone. Berthe Morisot and Mary Cassatt from the 19th century Impressionist School portrayed what could be called female subject matter and were thus categorised as minor painters, as they had a ‘lifted’ a set of traditions which were not their own. They were socially conditioned to depict life in a certain way and remained in the sidelines, while Renoir and Monet, who were also known for depicting scenes from the household, did pretty well for themselves. The problem lay in the fact that they were trying to outdo men in a culture created by them, in whose creation they had no role to play, and which could be easily manipulated by them. For a true female aesthetic to emerge, it would take a complete denial of all cultural tradition, starting with unlearning whatever one has been taught to believe as the absolute truth. The above publication is very obviously a satire, but it does manage to capture the essence of discrimination and marginalisation faced by women artists at the hands of critics around that time and even before. 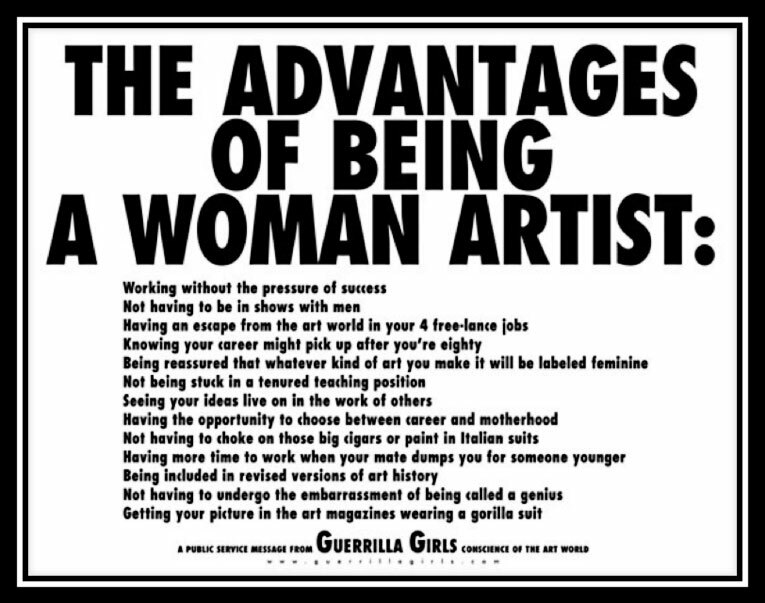 The Guerrilla Girls might be propagandist—all political groups with an agenda almost always are—but they end up raising significant and valid questions, such as why women artists have been neglected by art historians, and why there have been no great women artists in the past. 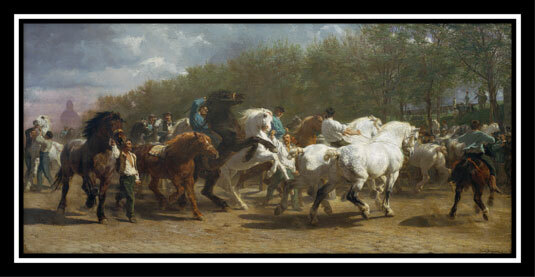 Horse Fair by Rosa Bonheur. Nochlin further says that great art is never just the expression of the artist’s emotions on the canvas; it is more than that, with a particular style, free of conventions developed over years of practice and experimentation. In this sense, “… there are no women equivalents for Michelangelo or Rembrandt, Delacroix or Cezanne, Picasso or Matisse, or even in the very recent times, for Willem de Kooning or Andy Warhol, any more than there are black American equivalents for the same. If there actually were large numbers of ‘hidden’ great women artists… then what are the feminists fighting for?” Things remain oppressive for those who were not fortunate enough to be born white males, women and blacks included. The entire brouhaha surrounding the Great Artist is all but a myth, as for most of the initial ‘great’ artists art was just a profession of the lower social classes, passed from father to son. The absence of women from the art scene also holds true for the aristocracy, who might have dabbled in art but never took it up professionally, providing patronage instead. It is probable that the amount of time devoted to social functions made it impossible for both the upper class men and women in general to take it up as a full-fledged profession. The notion of individual genius as something innate does not exist per se, and scholars such as Piaget have stressed upon the fact that ability or intelligence is built-up step by step from infancy onwards based on observation and the patterns of adaptation-accommodation. ‘The Other’ is a series of articles that aims to rediscover women artists and the concept of feminism in art. Read part one and part three. Art knows no gender. If you have Picasso, you also have Amrita Sher Gill.Nature created Men and Women as complementary to each other. Somehow the present day enlightenment of women towards self-sufficiency drives a woman away from nature and when they miss the bus their frustration bursts out in denigrating men. Its nothing but the inferiority complex of a failed female that gives rise to such sentiments. Clearly sir you haven’t paid much attention to my articles. If you have then I don’t think you have the required intellect, discernibility or maturity to engage in a fruitful conversation with me. Besides, I’d like to say that Amrita Sher-Gill was feminist in her approach to art. Her oil paintings especially her female nudes and her self portaits are devoid of ‘physical’ beauty aimed at attracting the male attention. It leaves the viewer uneasy. Her triangular composition of the three Indian women with lowered gazes and the general expression on their faces creates melancholia if anything else. These young women, perhaps girls, are awaiting their future which doesn’t look too hopeful to them. They certainly aren’t excited about it. Anyway, I digress. I’d suggest you read the first and the second part of my article to gauge my argument better. And the final part will be out soon so wait for it. If after reading you actually have something interesting to say to me or to say in general I’d like your feedback very much. This is a place for smart people so lets not indulge in redundant cliches. You are an MCP but must we make it so obvious? Atleast be witty even in your sexist ways. Art is FELT and not analused mechanically. Anyway you r entitled to your view as much as I am to hold my views. read ‘ analysed’ instead of ‘ analused’pl. Then why comment on mine in the first place? And many would think that your logic (art should be felt not analysed) is heavily flawed. Any which way no point arguing about that with you. Doesn’t seem like you have much to say. article is really appreciable…when an artist is woman then she is called woman artist and on the other hand when an artist happens to be a man,he just remains artist.Imagination of god as a male ,female authors adopting masculine pen names really add density to gender issue regarding art and culture.lookimg forward for next part.